Succeed in your course and learn more about potential careers with ACSM’s Introduction to Exercise Science, 3rd Edition. This proven book provides an engaging, up-to-date overview of exercise science and related areas, such as athletic training and sports medicine. In every chapter, the author illustrates the importance and clinical relevance of each topic in the curriculum and gives you an insider’s view of the profession through fascinating interviews and online video profiles and fieldtrips. As an American College of Sports Medicine publication, this full-color resource offers the unsurpassed quality and excellence that has become synonymous with titles by the leading exercise science and sports medicine organization in the world. NEW! A brand-new chapter shows how research is conducted, provides an overview of research as a career pursuit, and explores the concept of evidence-base practice. Video fieldtrips take you into different real-world settings to learn about exercise science careers. UPDATED! Interviews and video profiles of rising stars in the exercise science profession and working healthcare professionals (a dietician, cardiologist, exercise physiologist, etc.) demonstrate the challenges and rewards of careers that begin with an exercise science degree. UPDATED! The “Future of Exercise Science” chapter now reflects the latest trends in the field. 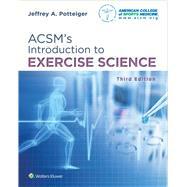 Features important updates related to the 10th edition of ACSM’s Guidelines for Exercise Testing and Prescription. REVISED! The motor behavior chapter is now more meaningful, relevant, up-to-date, and understandable. Chapter objectives, key terms and definitions, chapter summaries, and Thinking Critically boxes help you master key concepts.